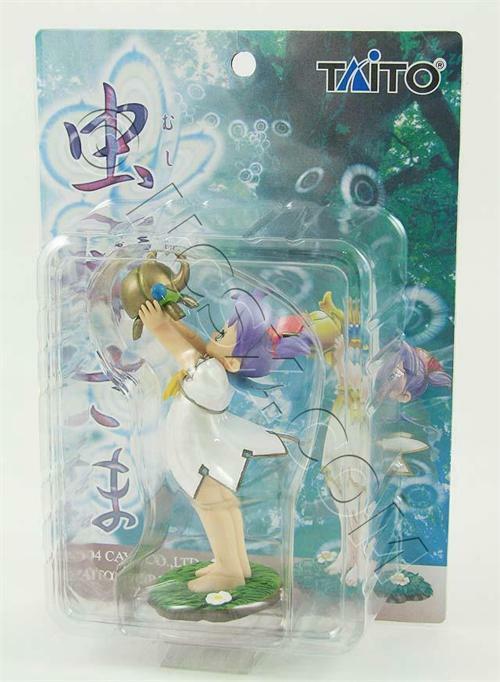 «©NCSX» When Mushihimesame was released for the Playstation 2 a few years ago, Taito also shipped a limited edition version of the game which included a Princess Reko figure. She's the heroine of the game and the figure features her asa wee lassie holding aloft her pet Kiniro when it was just a baby beetle. Reko seemingly beams with pride while baby Kiniro appears content just to be somewhere. Reko stands upon a grassy patch with two daisies to the left and right of her feet. The diorama measures approximately 5" tall from grass patch to the tip of Kiniro's pointy horn. Miss Reko and Kiniro are packaged in a cardboard backed blister pack which slips into the mint condition Mushihimesama Limited Edition cardboard box. Pricing is set at US$39.90 per Reko figure. This document is ©NCSX 2005, 2008, 2009. All rights reserved. No reproduction in whole or in part of this document may be made without express written consent of National Console Support, Inc.